Three people have been treated in hospital after a school bus crashed in County Fermanagh on Tuesday morning. No children were on board the bus when the accident happened on the A509 Derrylin Road at Mackan near Enniskillen at about 0830 GMT. A lorry shed its load going round a bend on the road. The bus coming in the other direction then hit the debris. 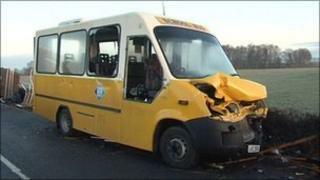 The bus driver has an arm injury and two adult passengers were also taken to hospital - one for shock. The road has been closed following the accident.